Enjoy the free word search printables listed below! Print these word searches for yourself or for use by your school, church, company, or other organization. Word searches are an excellent way to train concentration and visual perception. These word search printables are in "PDF" format, which makes them easy to view and print on any browser. I made these all these word search puzzles. You have my permission to print out, copy, and distribute them to anyone, including publishing them in a newsletter or newspaper, as long as the copyright notice and website name at the bottom of the word search stay in place. You can email the word search PDF file to anyone, or put it on your blog, website, etc. without restriction. Are you the publisher of a newsletter, bulletin, newspaper, or magazine? Include a word search puzzle or sudoku puzzle in each issue. Your readership will love it! In your publication, simply include the following copyright statement next to the puzzle: "© Memory-Improvement-Tips.com. Reprinted by Permission." To view and print a PDF file, you need the free Adobe PDF Reader installed on your computer. Many computers already have this. By the way, do you know a special needs student who might enjoy solving word search puzzles, such as a child or adult with autism or severe ADHD? Then check out my collection of Special Needs Word Search puzzles. Also free, of course! Here are the word searches you can print out. Click a link to open the word search PDF in a new window. After you open one of the word search PDF documents above, you can print it out by clicking the Printer icon at the top of the page. This opens a window where you can set options such as number of copies. The goal of a word search puzzle is to find all hidden words. The words can be forward, backward, vertical, horizontal, or at a diagonal in the puzzle. When you find a word in the puzzle, circle it. Be sure to cross each word off the list as you find it. Most word searches, including the printable word searches above, have a word list. This is simply a list of the words that you need to find. Traditional word searches are solved using a pencil and paper. If you print out one of these word searches, that's how you will solve it. Nowadays you can also solve word searches online in your browser. In the online version, you circle the hidden words using your mouse instead of with a pencil. Need More Word Search Printables? I don't mind making printable word searches. If you need a word search for a topic you don't see above, send me an email. I may be able to make it for you free of charge. There are a few strategies for solving words searches that I have found helpful. The most common strategy is to go through every row of the word search starting at the top left, looking for the first letter of the word you are trying to find. This can be tedious depending on the complexity of the puzzle, but it does work. Another word search tip is to look for letters that tend to stand out. These letters include Q, O, U, X, and Z. They are usually easy to spot. I also like to look for doubles. To do this, identify all the words in the word list that have double letters. For example, the word "HAPPY" has a double "P". Then visually scan the puzzle for the double. You should find it, and the word, pretty quickly. Word searches are one of my favorite types of puzzle. I hope you have fun with these free word search printables! 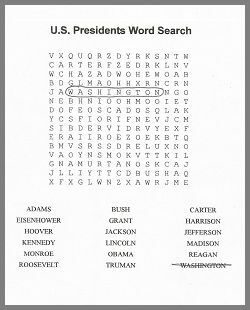 Note: If you prefer to solve word searches online, check out my free online word searches page or click the "Solve Online" links above.